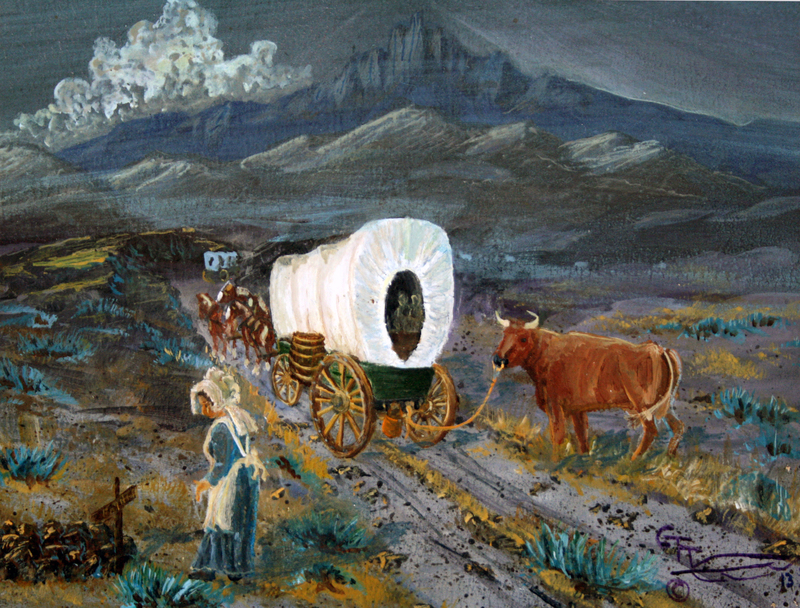 This entry was posted in Musings, Original Western Art and tagged american history, art, death, family, hope, landscape, opportunity, painting, pioneer, travel, wilderness. Bookmark the permalink. I really like this. Not only the subject, but the colors and composition. It tells a great story. Thank you. It’s close to my heart. I can see that. It comes across in the piece. Thanks for posting it. oooooh! I really love this!! Thank you, Cindy – I really appreciate your comment. You have captured the true story of so many amazing people. Thanks for such a nice comment, it’s greatly appreciated. Incredible painting Gale, and I love the imagery you create in your post. Every time I am out in nature, I cannot help but think back centuries and how life would be… The one thought that always lingers a bit longer, is how I would handle bringing family members into the wilderness…and how worried I would be for their health/discomfort. Then I begin to realize that this worry is more of a ‘modern-day’ phenomena as such travails were “just a part of life” back then when taking greater risks was a common choice. The painting bring out the greatest of those people, and the decisions they made. Thanks for such a great comment – you’ve expressed my thoughts exactly. These people were strong, brave and determined, but didn’t think of it that way, they were just doing what they thought they needed to. Thanks again. Exactly – strong people indeed. Beautiful painting Gale portraying everything these people had to endure in order to achieve their dreams. Heartbreaking. You’ve expressed the moment so very well. Both your painting and words bring us into this time in history. So hard to imagine the hardships today. Only the very tough survived and even then life was short. But there is always the dream of a better life. Wonderful post Trapper. I love history and ponder this period of American history the most. I guess it is because I live in the West deserts of California. As I travel about, I gaze at the ruggedness of the scenery and often wonder how anyone made it before the more modern times. I love the sentiments captured in that art. Thank you CJ. Like you, I too love this period of American history, and wonder just how folks survived and sometimes even thrived in those wild and untamed places. WOW. No exclamation point, just one of those little dots. Your written word and your painted art-word both bring a sacred stillness with a sobering reality of “the way” that our predecessors / ancestors traveled: a harsh-at-times journey and a costly choice of moving forward for a redemption that waited ahead of them. The word “remembering” came to me as I considered your post. And “remembering” is a … “lost art”? Sorry for the long rely … My last post, and thank you for visiting … carried some of this substane you have in your post but no painting. IYou do good work. Wilder Man, thank you for stopping by and leaving such a considered and thoughtful comment. Thanks for getting what I was trying to say… and show. Those who came before were indeed hardy, tough and yes, adventurous – just like the men you wrote about. I think you succeeded in expressing the emotion. It appears to be a beautiful success to me. Lovely. I like the history behind this painting and the story you have included in it. Saying I ‘like’ the history is a bit odd but words escape me at the moment. It must have been an incredible experience – both for the potential opportunities but also for the probable hazards. I guess you had to be either brave or desperate. Thanks, Noeline. I figure they were brave, desperate or both! I like all the cool blue in this that serves to back up the theme of loneliness and truth of the hardship these pioneers faced. Though sad, everything you did pushes forth this story. Very lonely. I’m impatiently awaiting an installment for March.